Learn how to set up the anti-virus policy to direct the scanning of messages for viruses. The Anti-Virus Policy is used to direct the scanning of messages for viruses. The Network Director itself does not scan for viruses; the virus scanning is managed by an anti-virus server. What messages should be scanned. How to communicate with the anti-virus server. What action should be performed when a virus is detected. Create the policy definition. See below. Configure the policy details. See Configuring an Anti-Virus Policy. Once you've completed both those steps, you can activate the policy so that it's in effect and can be attached to organizations and services. In the Organization Tree, find the level at which you want to create the policy. Expand Policies and click Operational Policies. In the right pane, in the Policies Summary section, click Add Policy. To create a new policy: Choose Anti Virus Policy and then click Next. To import an existing policy: Click Import Policy, browse for the file, and then click Next. Enter Policy Name (required), Policy Key, and Description (optional). If you don't specify a key, one is assigned automatically. At this point, you've created the policy, but it doesn't do anything. The next step is to configure the policy details. See Configuring an Anti-Virus Policy below. In the center pane, in the Anti Virus Policy section, click Modify. The Modify Anti-Virus Policy overlay is displayed, as shown below. Choose a value for Max Message Size (MB). Messages exceeding the specified size will be rejected by the policy. Scan Entire Message: scans all message content including attachments. Scan All Attachments: scans only attachments. Scan By Content Type: you can specify message content-types that should be scanned. Choices: application/msword, application/octet-stream, application/vnd.ms-excel, application/vnd.ms-powerpoint, application/vnd.ms-project, application/vnd.ms-works, application/x-msaccess, video/mpeg, x-world/x-vrml. You can multi-select to specify multiple content types. Specify the URL of the ICAP server (the anti-virus server). Log: Allows the content through but generates an alert. Reject: Rejects the message and generates an alert. Strip: Removes the infected portion of the message and generates an alert. You can review the details of the existing anti-virus policy, then change them if needed. Enter the following navigation path: Workbench > Browse > Organization. Choose the Policies folder. 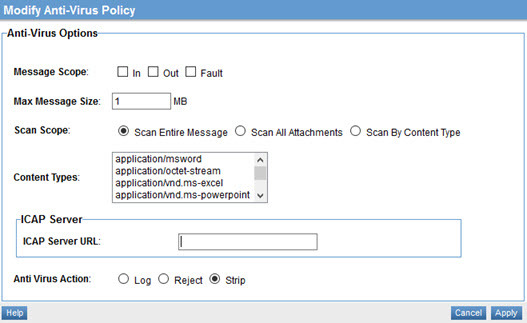 The Policies Summary screen displays. Click the policy name and then double-click the Anti-Virus Policy line item. Select View Policy Details from the Actions drop-down list box. The Policy Details page for the Anti-Virus Policy is displayed. For an example of how you could use an anti-virus policy to scan uploaded files, refer to Configure the Anti-virus Policy to scan for uploaded files in the platform hardening doc.